Traditionally, trifle custard is made using milk, sugar and egg. Although this approach delivers a delicious product, manufacturers can find it difficult to achieve texture consistency. Sticking to these three ingredients alone will also not deliver a product which meets the shelf-life requirements of today’s food industry. 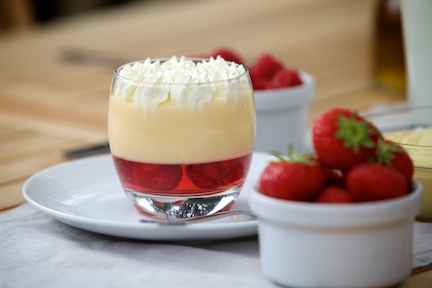 Recent years have seen the evolution of consumer and retail trends, resulting in many different variations of trifle custard. Each is designed to meet the quality requirements of manufacturers, retailers and consumers. Variations include custards which are fresh, UHT, low-cost, luxury or clean label. We will work with you to evaluate your current process and determine the right ingredients. And we can show you the best process in our pilot plant facility. After successfully testing the process with your own recipe we can help you upscale production in your own facility together. Contact us today for our help and advice. KaTech can help you reduce the cost of producing custard trifle, while always ensuring product quality is maintained. Our approach is based on cost reengineering your recipe. Talk to us today about we can help you retain your profit margins by reducing recipe cost.